Every now and then, we get lucky enough to see a shooting star and we watch in wonder as it makes its way across the sky. 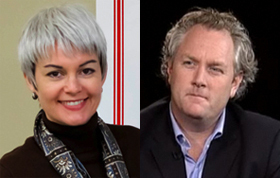 Andrew Breitbart was gloriously, joyously effective in the ways he exposed the left for what they are, leaving many of them either speechless or sputtering in profane frustration. He lifted our hearts, and more than that, he showed us what was possible through one person's actions. We had the honor of hosting Andrew at our Tea Party in the Park in October of 2010. As many have written, he was totally accessible, down to earth, charming, humble. As this video from the event shows, Andrew understood the nature of the battle in which we are engaged, a battle that we will wage over the next 20-30 years. His words are just as relevant today; please watch. "Something has happened in the last few years, and that is that we no longer just have just Rush and Drudge to tell us the truth, we now have us." "We all now have the ability to take these people on ...and we're going to be the America that is going to save this country and we're going to take on the bullies out there, whether it be the SEIU the ALF-CIO, ACCORN, the President, our corrupt congressmen, and anyone in the Republican party that doesn't get it...This has been an awakening for our country." "Hope and change does not come from people on the left." Andrew showed us what one person could do. The torch is now in our hands. What can YOU do to carry on?